Staten Island Chuck will make his annual weather forecast at the Staten Island Zoo on Thursday, Feb. 2, 2017. WEST BRIGHTON — Staten Island's favorite forecaster Chuck will make his annual prediction Thursday, but remains on edge in case the groundhog-killing mayor will show up again. 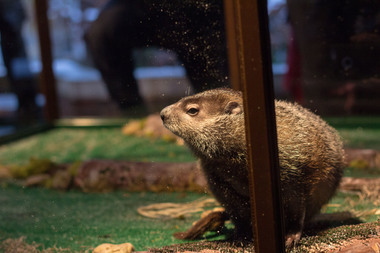 Mayor Bill de Blasio has not confirmed if he'll attend the Groundhog Day ceremony at the Staten Island Zoo Thursday morning where the furry prognosticator will predict the length of the remaining winter, a spokeswoman for the mayor said. If de Blasio decides to skip the ceremony — which he did last year to campaign for Hillary Clinton — Chuck can breathe a sigh of relief. In 2014, de Blasio dropped the groundhog — later revealed to be a stand-in named Charlotte — as he took her out of her home to make the annual prediction. A week later, Charlotte was found dead in her cage after suffering from internal injuries, the New York Post reported. A spokesman for the zoo said she showed no signs of trauma or pain during a medical examination after the ceremony. Still the museum took extra precautions in 2015 when the mayor returned and had Staten Island Chuck lifted from his burrow by an elevator and kept in a Plexiglass box. Last year, Lt. Gov. Kathy Hochul filled in for the mayor, but Chuck was only picked up by his handler. Despite having a stellar track record for correctly predicting the weather, Chuck has had less than cordial relationships with the city's mayors. In 2009, Chuck took a bite out of then Mayor Michael Bloomberg's finger as he tried to coax the groundhog out of his winter nest. Bloomberg used a plunger to get Chuck out instead of his hands in 2011 and was caught on video calling him a "son of a b--ch." "I love the plunger," Bloomberg said on a video, originally posted by the Daily News. "That was so much better than having to reach in and let the son of a b--ch bite you." Hizzoner vowed to bite back if Chuck struck again in their final meeting in 2012, and skipped Chuck's 2013 prediction. Chuck will make his 36th prediction this year and has a better accuracy rating than his more famous counterpart Punxsutawney Phil. A DNAinfo New York review of both groundhogs' predictions from 1992 to 2015 found Chuck had an impressive 66.7 percent accuracy rating while Phil only had a 38.9 percent rating. The ceremony will be open to the public at the Staten Island Zoo, 614 Broadway, and gates will open at 6:30 a.m. Chuck's scheduled to make his forecast at 7 a.m.